One look at Troy-Bilt’s WC33 Zero-Turn gas-powered lawn mower will tell you right away you’re getting something different–and special. Powered by four rear-wheel drive speeds, it’s kind of like walking behind a mini-tractor with plenty of great functions. Why a mini-tractor? 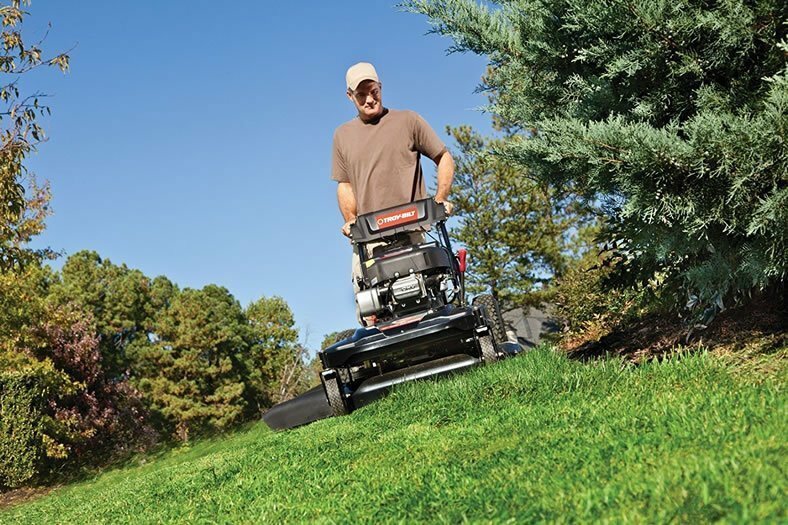 To start, this heavyweight mower cuts a super-wide 33-inch path, so it’s the ideal machine for large yards. A further time-saver is the mower’s zero-turn capability for optimal maneuverability going back and forth on passes. The electric-start overhead-valve engine starts with the turn of a key and has the power needed to get the job done at an efficient and precise rate. The WC33 can mulch and has side discharge, and a bagging option is available if you purchase the bag separately. 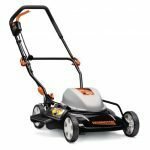 Beyond its zero-turn capability, this mower also features a signature Blade Brake Clutch Blade Disengagement function, and a clear-view two-gallon gas tank that allows you to see how much fuel you have on the fly. 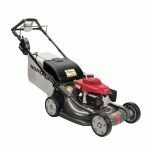 Known to tackle yards of up to two acres, the WC33 has a nice mulching function that will leave your yard looking very well groomed. 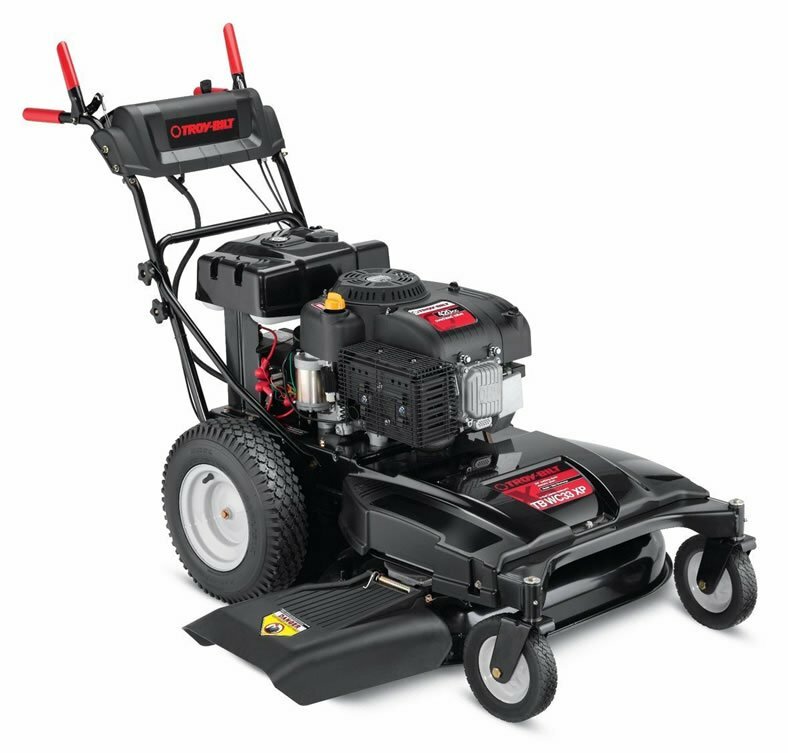 It offers a much wider cut than most mowers, so after using it, you’ll feel like your former 21-inch gas-powered machine was comparatively inefficient. If you’ve got steep grades on your lawn, don’t worry. This machine handles such terrain in an outstanding way, though you may want to run it up and down rather than lengthwise. 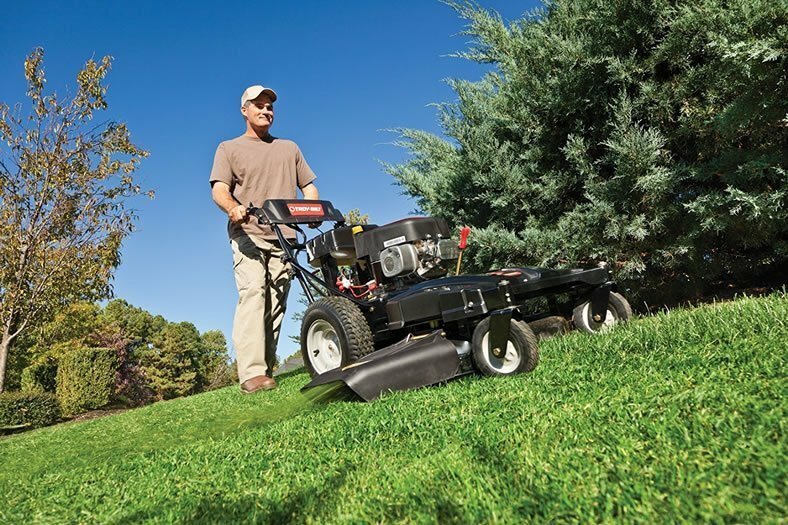 Of course, if you DON’T feel comfortable using a mower like this on slopes and hills but have a large yard, you could always use your normal 21-inch mower for those portions and save the WC33 for the more sprawling terrain. But it’s fun using the WC33 on steep hills because you feel like you’re being pulled upward with all that power. The grass chute unfortunately spews grass straight downward instead of spreading it outward evenly, so you may have a line of grass chunks between passes. I also noticed you can’t adjust the chute to go vertical, which means the mower isn’t ideal for tight spaces and won’t fit as well in storage. I should also mention the durable wheels. The front ones are 8 inches with a caster and ball bearings, and the rear pneumatic wheels are an impressive 16 inches, offering added maneuverability. Provided you take care of it, the WC33 should provide an outstanding cut for your yard well beyond a decade. My “mini-tractor” comment in the above “Overview” section might indicate that the WC33 is a bit of a beast to handle, and at first, it is. The control grip is wide and can be tough to use; there’s definitely an operator’s “touch” that you’ll have to master before you feel totally comfortable. Slowing down to make a turn, for instance, takes some getting used to. Still, after you get used to the variable forward speeds and the instant-turn maneuverability of the zero-turn function, you should find it to be highly efficient and easy to use. The WC33 eventually gets pretty easy to shift on the fly, and the brisk walk behind it will make you feel like you’re getting some good exercise. Also, folks will love the simple height-cutting adjustment and how easy it is to start this mower with the turn of a key so that you can start the job right away. Given the power that comes through on the handlebars of this mower, it may not be ideal for those who don’t have the needed strength. After using it for a half hour, you definitely feel it! However, over time, you’ll likely get used to this mower, and using it regularly could build up your endurance. Lastly, the WC33 is louder than the typical gas-powered mower, so you might want to insert some ear plugs. No two ways about it, this mower cuts grass evenly and great and can churn leaves into a billion pieces. But keep in mind if you’ve got really tall grass, the large 33-inch cutting swath may thin out on the edges a bit, causing streaks of uncut grass you may have to go over again. The mower may have benefitted from a taller height adjustment. 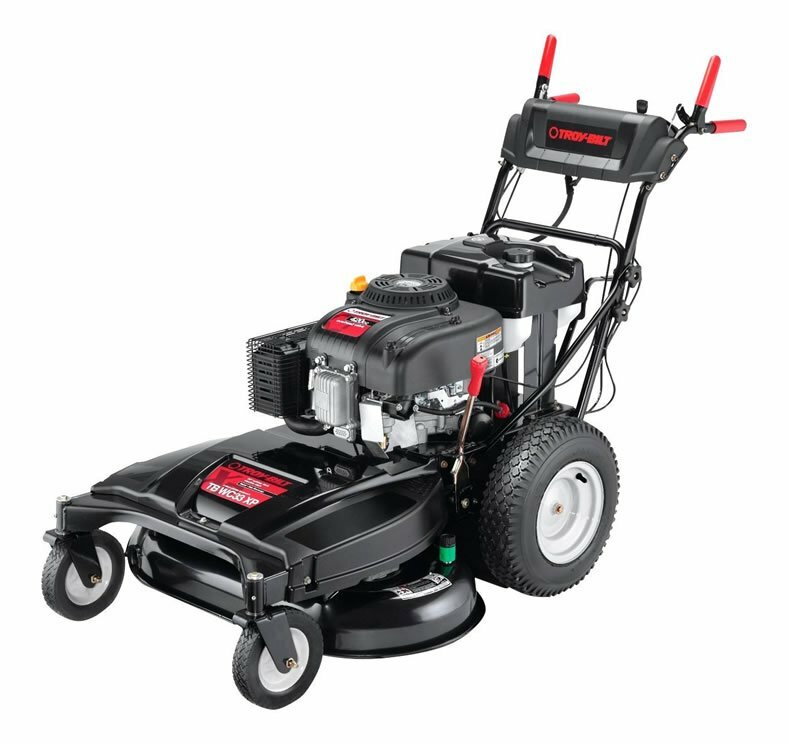 Also, the front end of the handle is a bit light and may bounce on rough terrain, which takes a bit more concentration in keeping the mowing lines straight. On the positive side, no matter how long grass gets, it seems this machine was built to NOT stall out ever. The WC33 has side discharge and can mulch. You can also purchase a bag collector for it, but if you do, note that the bag lays up against the rear wheel, which may eventually form a hole. Crafty mowers may be able to fix that issue on their own. Also, I was pleasantly surprised to see that the WC33 is a pretty gas-efficient machine. The throttle/choke control on the mower is used to adjust the engine speeds, activate the engine choke, and stop the engine. The blade control on the right handle engages the mowing deck and will stop the blades once it is released. A key is needed to start the WC33. The machine has four forward speeds and can go in reverse and be set in neutral. 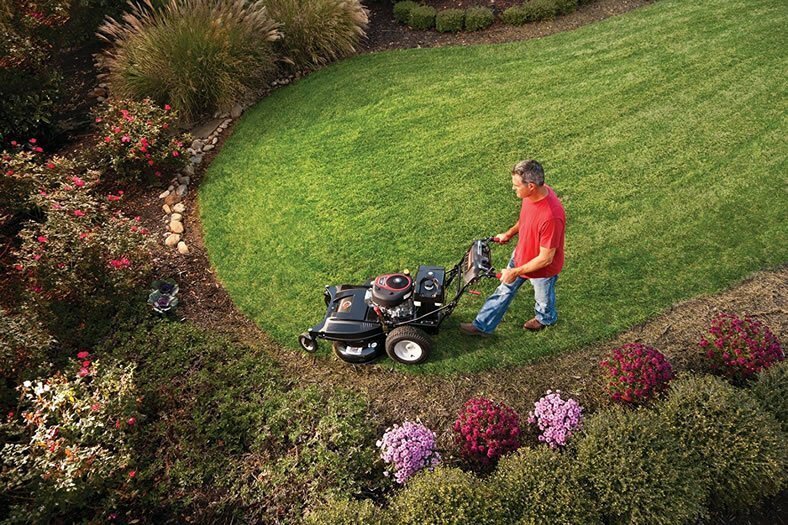 If you’ve got a big yard, you’re going to love the 33-inch cutting capability of this machine. You’re also going to love its “turn-on-a-dime” zero-turn capability; its twin-blade cutting deck that has a washing attachment; its large, sturdy wheels; and its rear-wheel self-propelled variable-speed power. All of these functions are engaged with the simple turn of a key–no pulling a cord here. Some might argue that you could purchase a riding lawn mower for the price you’re paying for the WC33, which is logical. But I would also say that the functions on this mower are much more efficient than what you’d get on a decent riding lawn mower. Zero-turn capability, variable speeds, a powerful engine, good gas efficiency, and 2-in-1 grass-cutting options all make the WC33 a worthwhile investment. Also, it truly is a mower that will last a long time–well over a decade–if you treat it right.